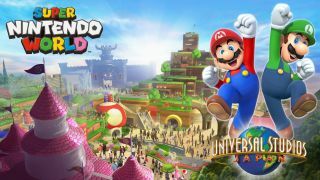 OK, we were already excited but Nintendo has revealed Super Nintendo World on Twitter and it might be time to start planning a 2020 trip to Universal Studios in Osaka. Thankfully it was confirmed last month that Nintendo sections will be coming to both Universal Studios in California and Florida as well as the Japanese park. Osaka might be the first one that opens though, as it's been confirmed to be ready in time for the 2020 Olympics. Just look at that image. Hordes of theme park goers walking through pipes... mushroom houses... Peach's castle overseeing proceedings. This was always going to be impressive and of course this is just an artists impression but just look at it and this is all before a single ride is revealed. Nintendo has already announced that guests will "feel like they are playing inside their favourite games" and given the success of Universal's Wizarding World of Harry Potter, clearly no expense is being spared here. Continuing the Jurassic Park references, hopefully the piranha plants won't eat the tourists. If you can't wait until 2020, fill the next five minutes with our ideas for the rides that Nintendo's theme park needs.